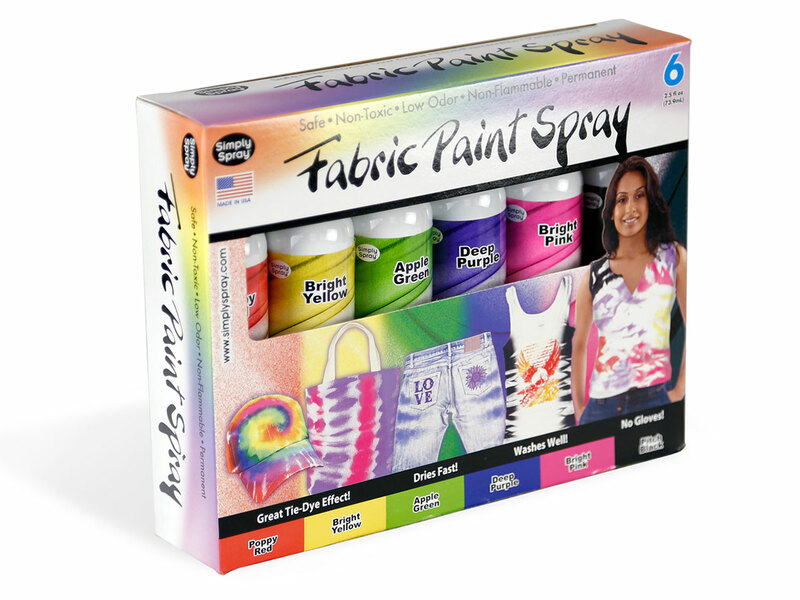 Simply Spray Craft and Clothing Fabric Spray Paint is a great way to color your clothing. It air dries so there is no need to heat set. Colors are permanent after drying for 72 hours. Simply Spray's non-toxic food-safe propellant does not have harsh fumes so it is safe for children to use. The paint dries softly so it is comfortable to wear. You can launder painted clothing in a regular washing machine after it is completely dry. Colors will not fade away. This is a great product for kids to make tie-dyed shirts and pillow cases. The easy clean up is a joy for parents and teachers. Tie-dye the quick and easy way with Simply Spray. These 2.5-ounce crafts cans are specifically designed for items that will be laundered. Do not use craft and clothing fabric spray paint on things that will be sat upon or frequently rubbed. This paint works on absorbent materials only. Do not soak your fabric. This wastes paint. A little goes a long way. To make the fabric darker, spray a light first coat and let it dry for 20 minutes, then spray a second coat. For blending, spray a second coat on while wet. For tie-dye effects, fold loosely for more coverage. Kids tend to use more paint than needed. They also often need help pulling the trigger all the way back. If you are using craft paint with a stencil, spray very lightly and blot up excess paint with a towel before removing stencil. This helps prevent bleeding underneath the stencil. Make sure to read the step-by-step instructions prior to painting for best results.